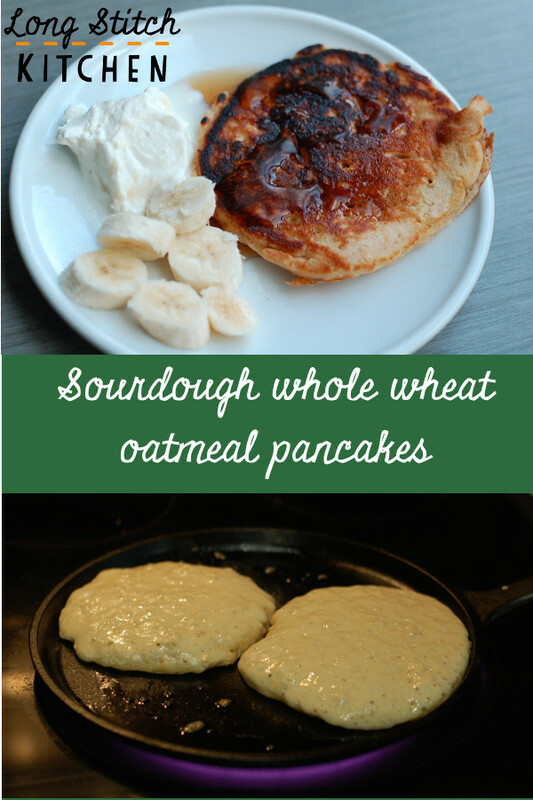 Ok, admittedly, this is kind of a mouthful of a recipe title, and you might be thinking: wow, sourdough and whole wheat and oatmeal in a pancake seems like kind of a lot. Full disclosure: these are kind of a lot. 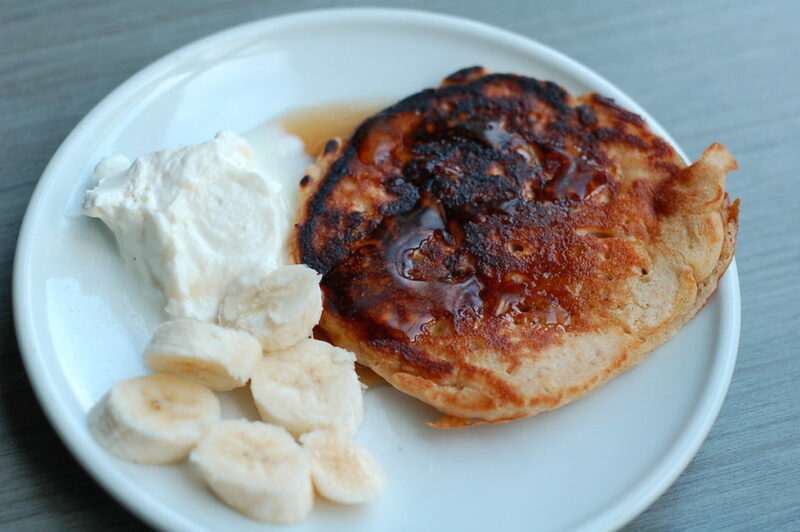 They are hearty and serious, especially when you serve with generous pats of butter, sweet and perfect New England maple syrup (don’t even try it, Canada), and a dollop of full fat beautiful Greek yogurt. Which means they are perfect for a crisp Sunday morning when you don’t feel like standing at your griddle for forty-five minutes making an enormous batch of normal pancakes. This recipe is adapted from one I found many years ago on Weelicious, back when I was paranoid about feeding my single, pure child regular white flour. Ha! Can you imagine. Now it’s a recipe I turn to when (a) my starter is overflowing, and (b) we want pancakes, but I want everyone to have a little more fuel in the tank than they get from ordinary pancakes. The oatmeal, whole wheat flour, and dollop of sourdough sticks to your ribs. Hilariously, as originally written, this recipe makes 25-30 little bitty pancakes. In my version below, it makes six very generous pancakes, and we find it’s plenty for our family of four. It’s important that you use a hungry starter for this – like around 24 hours since its last feeding. So whip these up when your starter is threatening to bust out of the top of your jar, before you do your daily feeding. If you don’t have a starter – you should absolutely get one going. Here are some instructions to get things rolling. 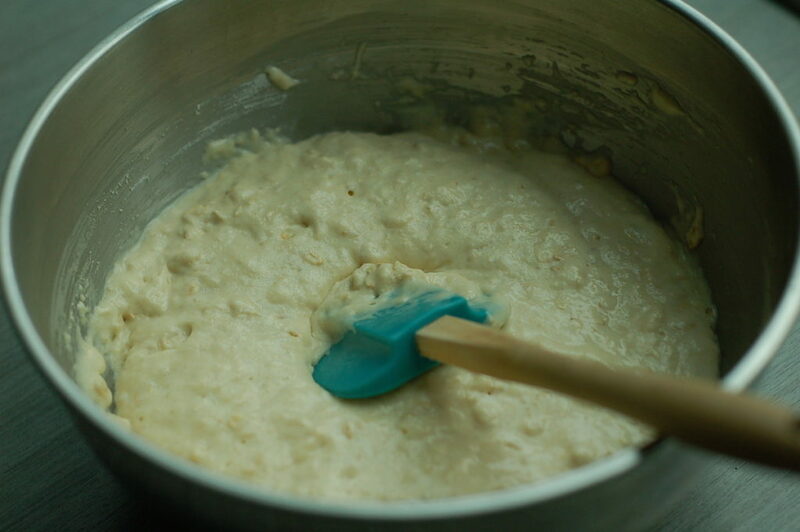 The batter, once everything is put together, should be quite fluffy and thick, with visible air bubbles. It won’t pour like an ordinary pancake batter, so use a measuring cup to plop it on your griddle. 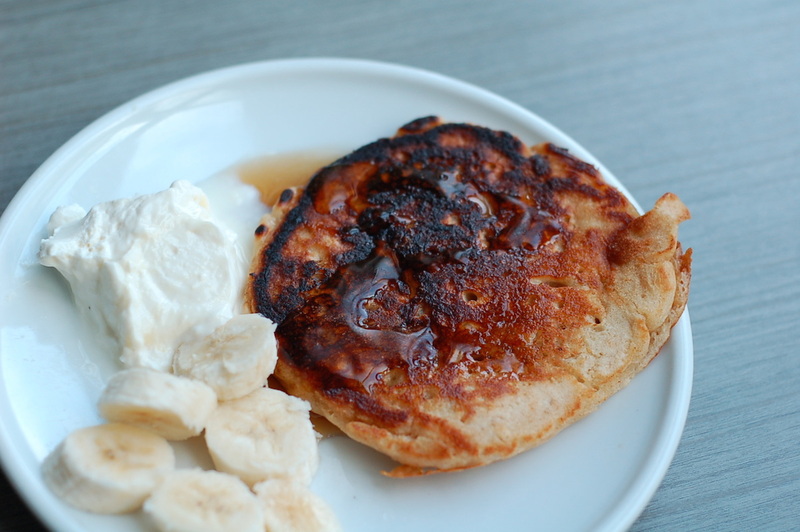 The resulting pancakes are also quite thick, but – as a fan of very thin, nearly crisp pancakes – I promise they are still worth eating as they are fluffy and delicious. First, melt your butter in a small saucepan on the stovetop (or in the microwave). You want it to cool slightly before adding it to the other ingredients. In a large bowl, whisk together the starter, milk, egg, and honey. Add the oats. They need to soak in the liquid for a few minutes to soften up. Combine the remaining dry ingredients in another smaller bowl, and mix with a fork: whole wheat pastry flour, baking powder and baking soda, and the salt. Begin heating your griddle or frying pan over medium-high heat. I usually use a large griddle and can do all the pancakes in one batch, but sadly that griddle is in storage, so I used my crepe cast iron pan. The butter should be cooled slightly by now, so add it into the wet ingredients and give it all a good whisk to combine. Add the dry ingredients into the bowl of wet ingredients and stir just until combined. Put a pat of butter on your griddle or pan. It should be nice and hot and melt the butter quickly (but try not to burn it). Drop pancakes onto the pan by about 3/4 cup scoops. Help them spread if needed using a spatula. Watch closely to ensure they won't burn. You'll know it is time to flip when the small bubbles on the surface are beginning to pop, 2-3 minutes. Flip and cook on the other side to your liking, we do another 1-2 minutes. Serve with butter, maple syrup, and whatever other fixings you like. We like Greek yogurt and whatever fruit we have lying around.